Finches make good pets for bird lovers. They are friendly and get along well with other finches and other hardbills. 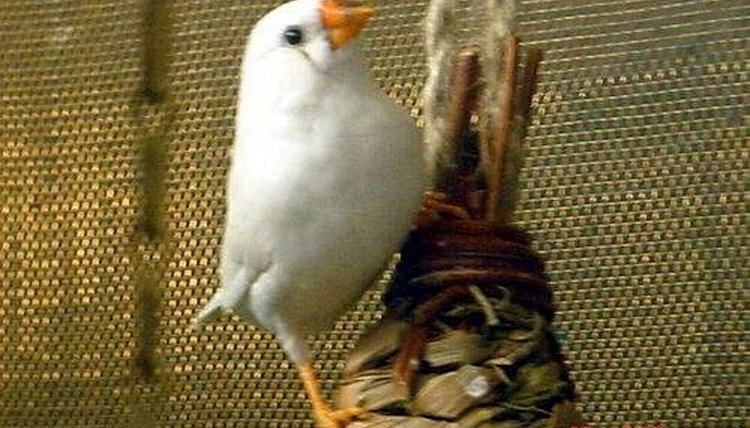 Zebra finches and Society finches are two kinds of finches that are popular as pets. Finches are fairly easy to take care of and need about the same care as other pet birds. You will need to make sure to provide a clean cage, perches, flying space, food, supplemental food, water to drink and for a bath, and toys. Many of the supplies you need you can find at your local pet store. Make sure to find a veterinarian who specializes or knows about bird care and have your finches examined at least once a year or as recommended by the vet. Buy a cage that is at least 12 by 18 inches. It should be placed about 6 feet from the ground and have good light. At night, you should cover the cage. Purchase natural perches for your pet finch. You can buy perches made from elm, maple, poplar and cherry trees. Concrete perches can be bought, but they can also harm the finches' feet, so they cannot be used all the time. Provide toys for the bird, but only a couple should go in the cage at a time. Examples of toys are swings, ladders, mirrors and bells. If you change them out, the bird will be more interested in its toys each time, and you can keep them clean easier. Give your finch fresh food and water every day, and keep the food and water containers clean. Pet stores sell finch food. They need about 1 tsp. of food a day. You should also supplement their food with fresh fruits and veggies and other treats such as milk-soaked wheat bread, meal worms, sprouted seed or spray millet. Put newspaper, paper towels, or brown bags at the bottom of the cage for easy cleaning a few times a week. Give your finch a bowl of water on the bottom of the cage to splash around in and take a birdbath. Once a week, the cage should be cleaned completely, and so should your finch.